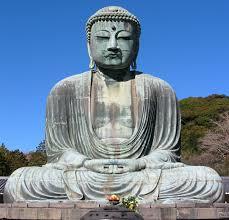 Buddhism is a religion that originated 2,500 years ago in Northern India in the fifth century B.C.E. The origin is traced to Siddhartha Gotama known as Buddha, meaning the “enlightened one.” Siddhartha Gotama observed the suffering of the world and set out to find an antidote. Through meditation he attained an enlighten state that marked the end of attachments and therefore suffering. The spiritual pathway of Buddhism begins with The Four Noble Truths and it is said that within these truths all of Buddha’s teachings are interwoven: the understanding of self, karma, rebirth, enlightenment and Nirvana. Thomas Knierim, Webmaster and Editor of the “Big View” blog, describes the Four Noble Truths as a gradual progression. Below he interprets the Truths, giving awareness to those of us seeking relief from the suffering we encounter in life. Human nature is not perfect, nor is the world we live in. Inevitably we endure suffering both physically and psychologically. There are different degrees of suffering; life is imperfect and subject to impermanence; this means we need to learn to accept the ebb and flow of life’s circumstances (Knierim, 2013). The origin of suffering is attachment to transient things and the ignorance thereof. It goes beyond objects and includes ideas and all objects of our perception. We create suffering by searching for things outside ourselves to make us happy and holding tightly to those “things” which will inevitably change and cause suffering (Knierim 2013). It is said we can end our suffering by attaining dispassion, by becoming devoid or impartial to our conceptual attachments. Attaining and perfecting dispassion ultimately results in the state of Nirvana, freedom from all worry and troubles (Knierim 2013). This is a gradual path of self-improvement, which is also the path to end suffering as described in the teaching of the Eightfold Path listed below. We find relief in seeking out the middle ground between self-extremes; hedonism (self-indulgence) and asceticism (self-mortification). The path in ending suffering can occur over many lifetimes through the cycle of rebirth. 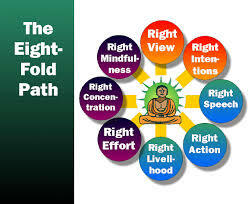 In understanding the Four Noble Truths, Buddha’s first sermon also described the Eightfold Path. According to O’Brien, Buddha’s teachings are to help us understand the oneness of life, end suffering and lead us in the right direction. She divides the eightfold path into three main sections: wisdom, ethical conduct and mental discipline. Right View and Right Intention cultivate wisdom. The Right View is about seeing the true nature of ourselves and the world around us, keeping us free from prejudice. Right Intention refers to the energy and commitment in our mind to have pure and good thoughts in the world (O’Brien 2013). Right Speech, Right Action and Right Livelihood are the ethical conduct path. This calls us into action, to refrain from harmful speech and to see that our deeds come from peace and goodwill and that we earn our living in such a way that we avoid bad karma (O’Brien 2013). The mental discipline is shown through Right Effort, Right Mindfulness, and Right Concentration. As we practice these disciplines we learn to see past delusions and overcome destructive desires. We cherish clarity or a good mind, for all that we think, and do. We practice the teachings of Buddha to the best of our abilities (O’Brien 2013). Karma is another important concept of Buddhism. The theory of Karma is a fundamental doctrine in Buddhism based on the law of moral causation. The theory of Karma was prevalent in India before Buddhism. However, Buddha explained and formulated this theory in detail. Buddha started to form this theory when he had unexplained questions: What is the cause of the inequality that exists among mankind? Why should some be blessed and others cursed from their birth? Why should others be congenitally blind, deaf, or deformed? According to Buddhism, this inequality is due to Karma. Karma is defined as any mental, verbal or physical action in past incarnations of life that can determine one’s destiny in future incarnations. Karma is the result of our past actions and our present doings. We are responsible for our happiness and misery. We create our heaven or hell. We are the architects for our own fate. Nirvana is the ultimate goal of all Buddhists. Nirvana can be achieved through following the eight noble paths and the four noble truths. It is the path of enlightenment, which leads to the cessation of suffering. Suffering is caused by our desires and expectations of how life should be. Nirvana is achieved though meditation and the practice of changing our patterns of thought and behavior, so that our mind and mood is not controlled by our desires for fulfillment. Achieving nirvana requires wisdom, ethical conduct, and mental discipline. Once nirvana is obtained, you are in a blissful or peaceful state of mind. By achieving nirvana, you can escape samsara, the cycle of reincarnation and stop accumulating bad karma because you’ve transcended it. Karma. (2013). Columbia Electronic Encyclopedia, 6th Edition, 1. Nirvana. (2013). Columbia Electronic Encyclopedia, 6th Edition, 1. Life becomes very simple. We begin to see things as they really are, not as we visualize them to be! This brings about incredible inner peace and happiness.